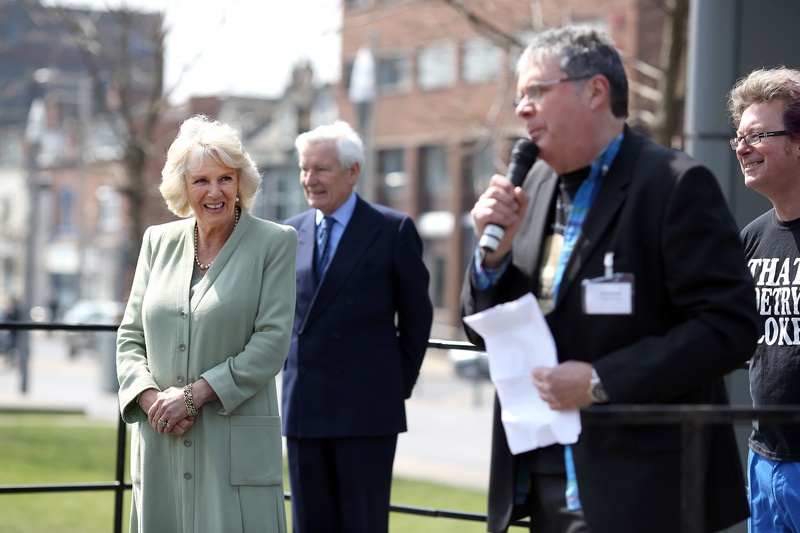 This is me announcing the fact that the three prizewinners of the poetry competition (one first and two runners up) were going to get a certificate from HRH the Duchess of Cornwall and a book of mine and a book of Craig’s as a prize. 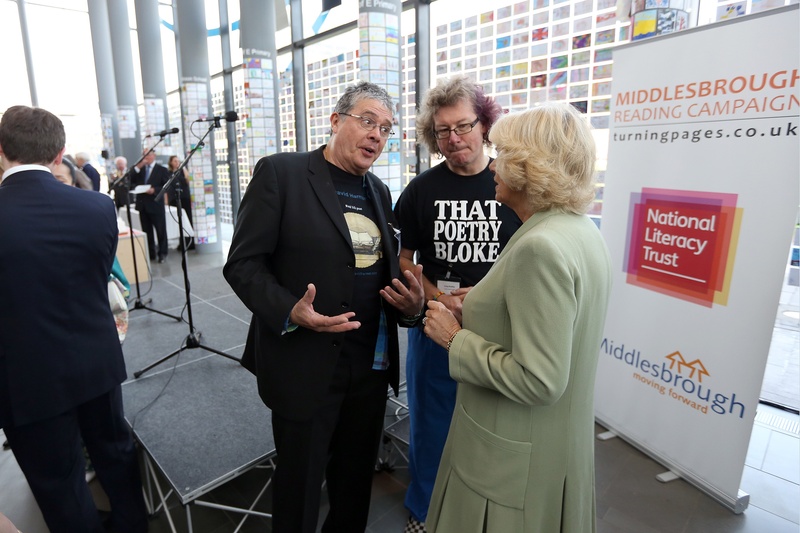 As you can see, HRH The Duchess agreed with me when I said of the two,the certificate was better. 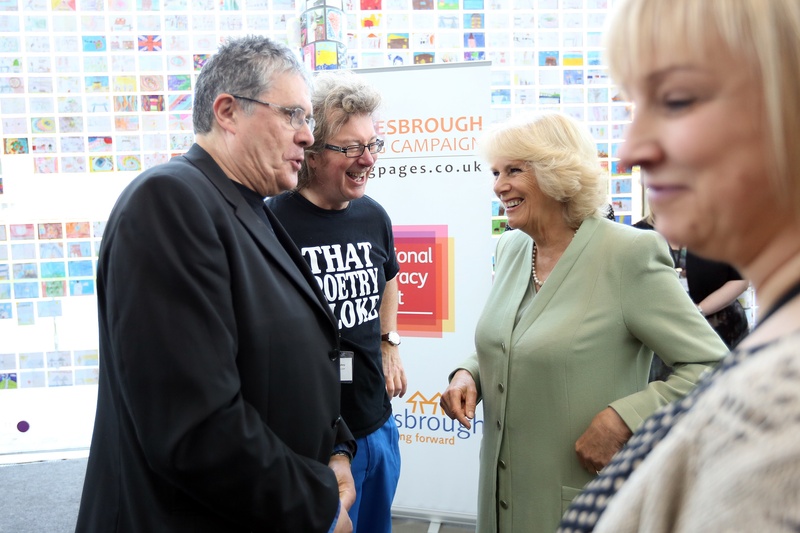 This was on the 2nd of May where I got to meet HRH The Duchess of Cornwall who is the patron of the National Literacy Trust, a fantastic charity which promotes all kinds of work to do with reading, writing, books and what have you all over the country. There had been a poetry competition which I judged and the three winners read their poems. Then HRH the Duchess of Cornwall presented them with prizes, walked through the crowd of children who were the audience and talked to just about all of them. then every child in the 500 crowd were given a free book!!!!!!!!!!!!!!!!!!!!!!!!!!!!!!!!!!!!!!!! Alongside me during this event, reading our poems to entertain all the audience before HRH arrived, was Craig Bradley, a really amazing poet. Recently in Calderdale I was called The Mad Poet! Which is fine BUT…….. 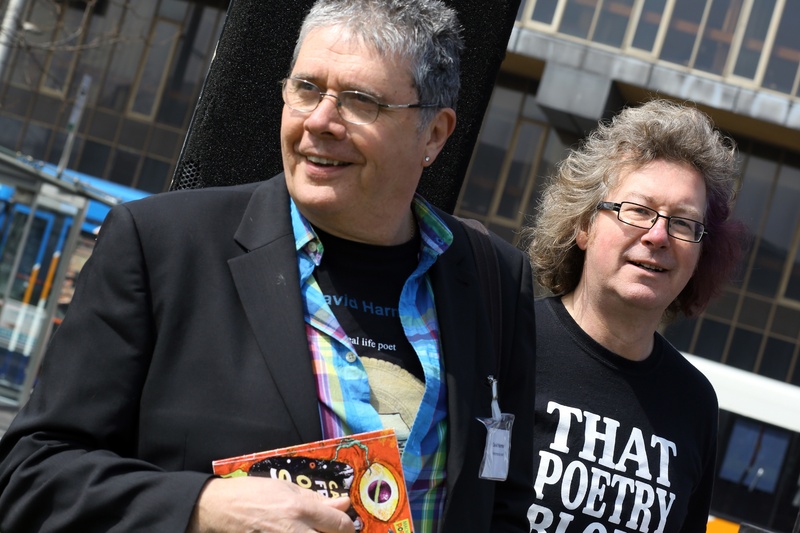 If you think I’m the Mad Poet wait til you meet Craig, he is BONKERS…in a very good way! We are getting on really well even if my face has started to wrinkle up into a rubber mask. Why I am pulling this face? I really don’t know but it is pretty stupid looking isn’t it? This is Craig having a laugh with the Duchess of Cornwall shortly before he was thrown into the Tower of London because I don’t think you are supposed to grab her arm! (joke, he didn’t and wasn’t and any way she was absolutely charming). These were the three children who did so well in the poetry competition. They are all from Middlesborough and wrote poems about an aspect of their home town they thought was important. Ellie wrote about Middlesborough FC, Jamie wrote about the really amazing transporter bridge they have there and Christopher wrote a wonderful poem The Spirit of Middlesborough. VERY well done all three of you! A really fabulous event, Craig and I had a great time!!!!! If you were there I hope you enjoyed it too. AND IT DIDN’T RAIN! Me and Craig waiting to do some poetry stuff!